Is it possible to learn too much about a film? Is it possible to be entertained almost to death? The questions are not meant to be considered criticisms of Inside The Wicker Man, rather simply to say that if you're interested in the making of the cult film you're in for a ride that will take you damn near close being too much of a good thing...close but not not quite. 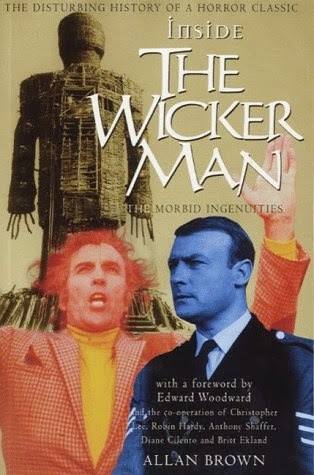 The Wicker Man is a film that was made by writer Anthony Schaeffer and director Robin Hardy about a police officer (Edward Woodward) who goes to an island off the Scottish coast to see what happened to a young girl who supposedly has gone missing. The island is lorded over by Lord Summerisle (Christopher Lee) who is both welcoming and ominous. What happens during the investigation is the movie. The film itself has been abused over the years. Made by a company who never really cared, it was rushed into production during fall (the film takes place in spring), it was cut and re-cut over the years so that it's survives in three different versions with the outtakes and trimmed footage was tossed away and is supposed to reside as filler under one of England's highways. The film was dumped into theaters at the bottom of a double bill with Don't Look Now, and given mixed reviews by critics. Allan Brown's book, which was first published in 2000 (this the edition I have, its been republished in 2010), predates the sequel, the remake and the recent "Directors Cut" so it simply focuses just on the making of the original classic film. Its a hell of a tale and probably would make a great film if anyone ever wanted to turn it into a film. The book covers the entire history of the film from its inception to its cult status with stops everywhere in between including the financing at a studio which didn't care, the battles between various parties (writer Anthony Shaffer and director Robin Hardy), the casting, the cutting and the support that Christopher Lee gave the film when everyone else gave up on it (he did interviews and gratis promotional appearances). Its all there in great detail told by many of the people who were there. When I say it's everything you'd want to know about the making and life of the film and more I'm not kidding. On the other hand the film is so full of detail that you get a fantastic sense of what it was like to be making films in the UK during the 1970's. I love the book immensely because you are there film journalism doesn't get much better than this. To me this is one of the best books on a film that I've come across.